In medium bowl, mix 1 cup of the flour, the granulated sugar, salt and yeast. Add milk, 2 tablespoons softened butter and the egg yolk. Beat with electric mixer on low speed 1 minute, scraping bowl frequently. Beat on medium speed 1 minute, scraping bowl frequently. Stir in enough remaining flour, 1/4 cup at a time, to make dough easy to handle. Place dough on lightly floured surface. Knead about 5 minutes or until dough is smooth and springy. Grease medium bowl with shortening. Place dough in bowl, turning dough to grease all sides. Cover bowl loosely with plastic wrap; let rise in warm place 1 hour to 1 hour 30 minutes or until dough has doubled in size. Dough is ready if indentation remains when touched. Spray 8-inch square pan with cooking spray. In 1-quart saucepan, heat 1/2 cup brown sugar and 1/4 cup softened butter to boiling, stirring constantly; remove from heat. Stir in corn syrup. Pour into pan. In small bowl, mix 1/4 cup brown sugar and 1/2 teaspoon cinnamon; set aside. Gently push fist into dough to deflate. Flatten dough with hands or rolling pin into 8x10-inch rectangle on lightly floured surface. Spread with 2 tablespoons softened butter; sprinkle with cinnamon sugar. Roll rectangle up tightly, beginning at 8-inch side. Pinch edge of dough into roll to seal. With fingers, shape until even. With serrated knife, cut roll into 4 (2-inch) slices. Place slices, cut sides up, slightly apart in pan. Cover loosely with plastic wrap; let rise in warm place 30 to 45 minutes or until dough has doubled in size. Heat oven to 350°F. Bake 28 to 32 minutes or until golden brown. Let stand 2 minutes. Place heatproof tray or serving plate upside down onto pan; immediately turn tray and pan over. Let pan remain on top of rolls 1 minute so caramel can drizzle over rolls; remove pan. Serve warm. 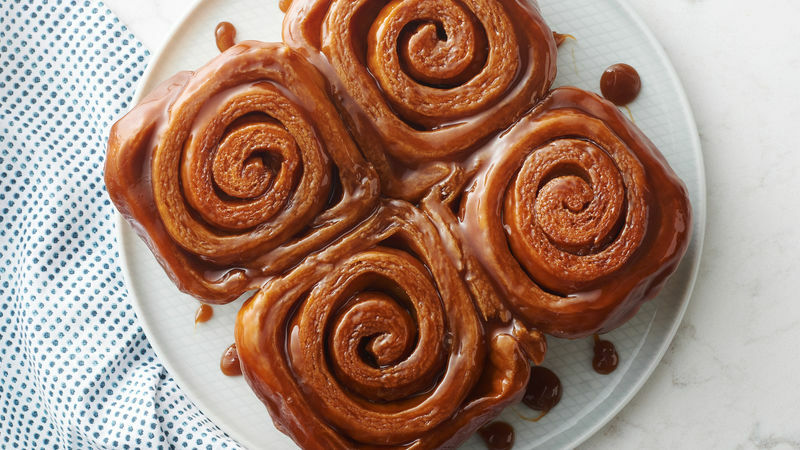 For pecan sticky rolls, sprinkle 1/2 cup whole pecans over the caramel topping in the pan, before rolls are placed on top. If you don’t have a sharp serrated knife, use unwaxed/unflavored dental floss to slice your sticky roll dough into rolls. Slide a 12-inch piece of the floss underneath the filled dough log. Pull each end of the floss up and over the roll, and crisscross the ends. Pull taut until the roll is completely cut.